Looking for a stepper with a difference? Or looking to get in shape without breaking the bank? Then look no further, this V-Fit Balance Pro Side Stepper could be just what you're looking for. Step and Rock your way to fitness with the added benefit of lower body toning, all you need to tone hips, legs and thighs. 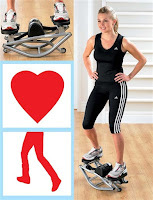 The V-Fit Balance Pro Side Stepper is a fun and easy to use side stepper.